Here you can find any part for your Ecopure Central Vacuum. Simply locate your model number listed above and click on the link, you will then be brought to a list of all of the parts available for your unit. If you don't see what you're after call us toll free at (855)649-7996. Package of 3 replacement NuTone central vacuum bags. These bags will fit in the following NuTone models: 350, 353, CV350, CV353, CV400, CV450, CV553CV554, CV556, CV570, CV653, CV750, PP500, PP600, and PP650. Always in stock and available from Central Vacuum Direct. Consider it a deadbolt against dust. With its micro-filtration removing fine dust down to 1 micron, this two-layer Micro Filtration Central Vacuum Exhaust Filter With Elbow provides maximum efficiency. Anti-allergenic. Fits most makes of central vacuums with 2 inch exhaust pipe coming off motor. Easy to install, no glue or tools required. We include a 90 degree elbow for mounting to exhaust port. Genuine Cana-Vac motor gasket for motors with a diameter of 5.7" to 6.6". Available from Central Vacuum Direct. Genuine Cana-Vac large motor gasket. Designed for motors with a 7.2" diameter. Available from Central Vacuum Direct. Genuine Canavac synthetic HEPA grade Vacuum bags for all full sized Canavac and RhinoVac models. These bags will fit the Titan TCS-5702 and TCS-6602 models and may be used in place of Nutone style 391 bags for upgraded performance.These high quality HEPA bags will capture 99.98% of all fine debris and allergens. Available from Central Vacuum Direct. 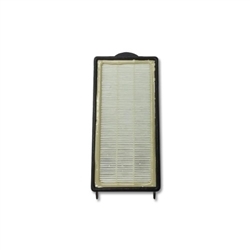 Replacement HEPA filter cartridge for central vacuum systems. To be used with the HFC9 HEPA filtration system. Replace every year for optimum filtration. Genuine Canavac 14.5" HEPA New Rolled In style filter. The manufacturer lists this as a 14.5" filter though the true measurement is 14". Cana-Vac models: 511XLS, 911XLS, and XES-725. Available from Central Vacuum Direct. Genuine 3 stage 120 volt Lamb central vacuum motor. This powerful motor will fit in a wide variety of popular models. Click for more information like models that this is compatible with and technical data. Available from Central Vacuum Direct. Genuine 2 stage 120V Lamb bypass motor. Genuine Cana-Vac 8.4" 2 stage central vacuum motor.